My Savage Worlds accessories for my Eberron campaign is now complete. I've posted about the Action Decks and Prophecy Shards (bennies) before, but I've finally acquired some appropriate Wild Dice. 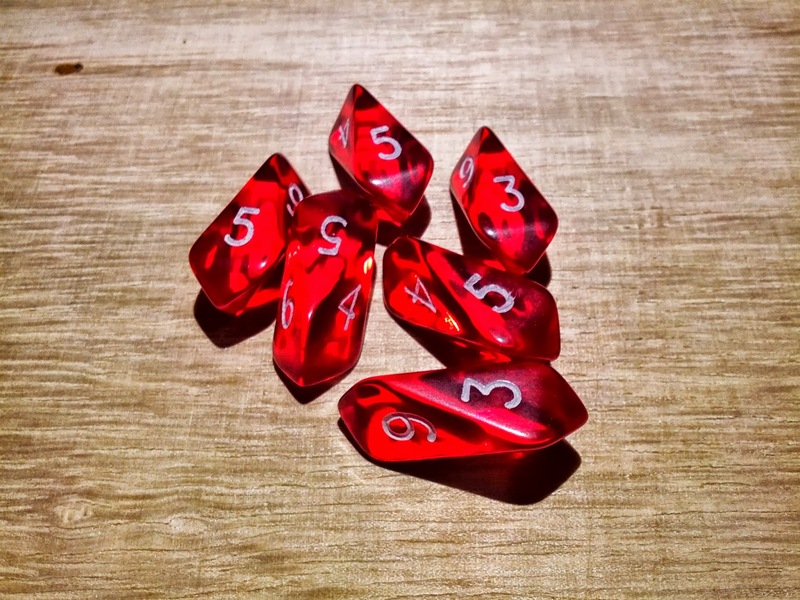 Crystal Caste's translucent red crystal d6s are perfect; they look like they came right out of a geode of Eberron dragonshards. At first some of my players were skeptical or seemingly disinterested when I emailed them the idea, but as soon as I dropped them on the table, they were all grabbing one and rolling them throughout the session. They were actually a bit larger than I had anticipated. They measure approximately 1" in length, so they feel pretty substantial. I had also anticipated they'd roll for quite a long while given their shape, but they stop pretty quickly after rolling them. Honestly, I think I might use these for just about any fantasy Savage Worlds game I play or run. Thanks! The Prophecy Shards as bennies is something I'm unjustly proud of. I say unjustly because it's a direct parallel to Deadlands' Fate Chips, so the mechanics aren't my idea, but they fit so well thematically and mechanically with Eberron, I had to use it.